Despite the massive acclaim, I didn’t like Silent Shout by The Knife initially; something about the production put me off, the density of it. I know it’s meant to be oppressive and strange, but it’s also meant to be pop, or catchy at the least, and the weight of the sound, the saturation of it, made me take against Silent Shout at first. I’ve grown to like it more over the years, and feel like I’m probably just half a dozen plays away from really, really liking it now. But the debut solo album by one half of The Knife, Karin Dreijer Andersson, clicked with me straight away, even though some people consider it to be even weirder, more oppressive, more unnerving and obtuse. The beats are less directly dance-oriented, the synthesisers and electronics more about atmosphere than about hooks, and, crucially for my ears, the production opens up, explores space and textural richness, and in doing so creates an almost tangibly beautiful landscape for Dreijer’s strange songs. 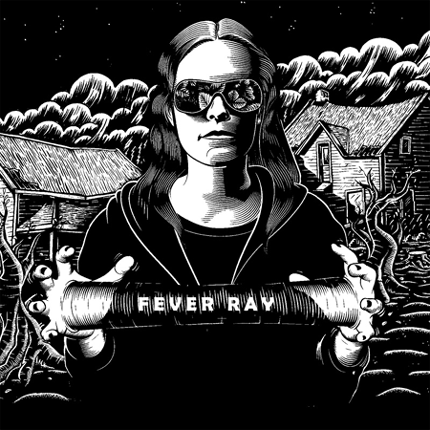 Because the songs on Fever Ray’s eponymous debut are nothing if not strange, concerned with the oddness of domesticity, observations and tales about both childhood and motherhood, lyrics about watering neighbours’ plants, about dishwasher tablets, about riding bicycles. Dreijer sings of living “between concrete walls / in my arms she felt so warm”, presumably a reference to her new status as a parent when she recorded the album. In some ways, Fever Ray’s album is like a weird cousin of Kate Bush’s Aerial, an album concerned with washing machines and children and maintaining sensuality despite (or because of?) these intrusions on adult life. But, as ever, I’m not focussing on the lyrics, as strange and beguiling as Dreijer’s vignettes may be: I’m taking in the pure sound of it. The slow-burning, thrumming introduction of If I Had A Heart; the beautiful final third of When I Grow Up, synths and guitars intertwining like lovers; the sparse, crepuscular vistas of Keep The Streets Empty For Me; and Karin’s vocals throughout, digitised, filtered, altered, made massive, cavernous, android and unreal even as she sings about the most mundanely human topics possible. Fever Ray is an incredible debut, an incredible record, the kind of thing that rewards attention and only gets better over time. I like it more than any single thing by the renowned group it’s an offshoot of, to the extent that thinking of it as a side-project, or solo excursion, seems ridiculous. Tom Listened: Rob lent me this album a while ago. I turned a cursory ear to some of it and was happy to return it to him knowing that I could cross it off my intended purchases list. While listening to it at record club I worked out what the problem is with it (as far as I am concerned anyway). It’s sequenced in such a way that the most accessible songs appear later on in the album. In this day and age, it is so rare for this to be the case that I reckon I unfairly dismissed this as being too bleak (Silent Shout was darker than my sensitive soul can cope with anyway) to bother with without ever having reached the latter half of the record. Well, giving this a proper listen last Wednesday, I can now see what all the fuss is about. I think I’ll always find Karin Andersson’s vocals to be a bit too ominous/alien for my taste (that acceptance speech thing doesn’t help) and I struggled to see the beauty in the tracks when it was pointed out but I did enjoy this much more than I thought I would and could see it really clicking in with a few more listens. Nick responded: See this is one of those odd things about music and ears and brains and stuff; I’ve always thought that Fever Ray started with its catchiest songs (at tracks 2 and 4) and then got darker and more impenetrable from there! Rob listened: Whoever said ‘Silent Shout’ was supposed to be catchy pop? It’s a nightmarish glimpse into a forest world of dark desires and degenerative disease, and quite brilliant for it. However, I can’t say much about ‘Fever Ray’ that Nick hasn’t already covered. For me it’s an almost perfect record in conception and execution. Eerily familiar yet tantalisingly alien, Karin Dreijer never puts a foot wrong. The sounds are melt-in-the-mind perfect, her vocals a woozy, half-remembered dream and the whole package one of my favourite records of the last ten years. Graham listened: Another new one on me and connected with it pretty much straight away. The use of synth and electronic sounds to create the atmosphere and feel of this album intrigue me opposed to the way their use on a lot of electronica/dance alienates me. Evoked some familiar atmospherics to that of early Cocteaus but also more weirdly I was reminded of the type of feel Depeche Mode were after with Songs of Faith and Devotion, strange?